The Resource Centre in Holloway Road, London, was the home for this year’s conference. The Annual conference brought together a diverse range of practitioners and students, to not only celebrate 30 years of MTI existence but further to recognise the journey that each of us has travelled, from the inceptions of the MTI to current day practice. The journey of the MTI was narrated through a keynote panel. It showed that it was important to remember where we started, how far we have travelled, what the challenges were at the start and how we now deal with and navigate the massage therapy terrain moving forward. The key concern is whether anything has really changed within the 30 years, or are we simply revisiting past experiences with changing lenses and focusses. The founders of the MTI: Andy Fagg, Darien Pritchard, and Sara Thomas, expanded their thinking, philosophies and ethos around the need to establish the MTI. It was welcoming to reflect upon and reminisce about the humble beginnings, while simultaneously realising and recognising the core values of the organisation. The keynote panel provided an opportunity for members to ask questions, compare journeys and collectively recognise the enormous contribution the MTI makes to the continuing development of massage and soft tissue practices in the UK. Founding members and key administrative staff were formally recognised for their contributions and tireless work in promoting and sustaining the MTI vision. 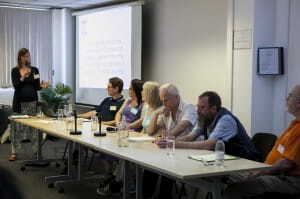 Following the main panel, members then attended workshops that provided opportunities to develop skills, question techniques, and work towards an evidence-informed approach to massage practice. 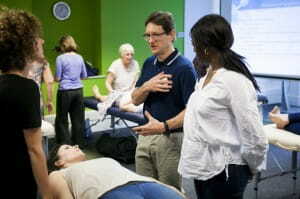 The workshops were well attended and were led by experts in the field of complementary therapy. As always, the marketplace was a hive of activity and attracted the attention it deserved. The exhibitors provided delegates with opportunities to explore new products, enquire about national campaigns and organisations, and view the MTI celebratory wall. The social media networks were ablaze with tweets, reviews, comments, encouragement and general praise for the MTI and organisation of the conference. Following lunch, delegates once again had an opportunity to develop their practices by attending further workshops. The conference concluded with a prize raffle, that saw members engage with a range of prize choices ranging from products to books, to courses. These were well received by all who stayed to the end. The conference concluded with a group photograph that summed up the success of the day and the excitement and energy that was palpable in helping the MTI move forward. This year we were proud to launch our new website, unveil our new banners, shirts, logo and straplines. While the conference is the pinnacle of the MTI calendar and often sets the tone for events to follows, we need to be mindful that MTI continues to build communities of practice through on-going initiatives, activities and campaigns. Remember to regularly visit our Twitter feed, Facebook page, and website to learn about the work we do and will continue to do. As chair, I was delighted to see so many new and returning colleagues at the conference. I am proud to chair the MTI and recognise the enormous strength, creativity, and integrity we hold within our membership. Together let’s work to enhance what we already have. See you next year in Solihull!